Is there a PDF viewer out there for MacOSX that support automatic reload of (in my case LaTex generated) PDFs when they're modified by another application? Skim provides this feature. 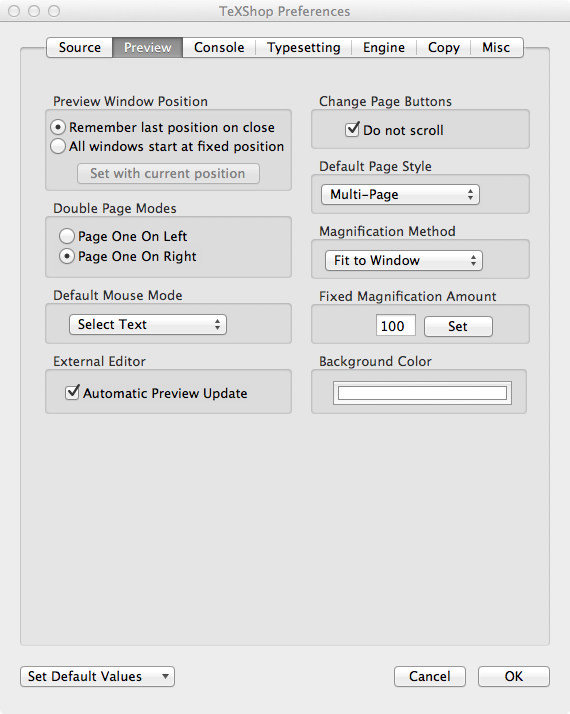 It also provides pdfsync synchronization, so I would consider it as the favorite PDF viewer for LaTeX! To turn on the feature, go to Preferences in the main Skim menu, then find the Sync tab and from there select Check for file changes and Reload automatically. Another potential nuisance: If you compile very large (that is, computation-intensive) documents, Skim sometimes gets out of sync with the file system or even crashes; for details look into this answer. This is simple with TeXShop installed. First launch TeXShop, and go into the preferences. In the second tab there is a tick box title called Automatic Preview Update. Make sure it's ticked. Now ok that, and quit TeXShop (you need to quit and reopen to make it honour the preference). Now all you need to do is open the pdf you're working on with TeXShop, and the TeX file in your editor of choice. Any changes to the pdf will make the viewer refresh. As you're using AquaMacs, you'll probably need to enable SyncTeX (if you want it) in the AucTeX options. There are more instructions on that here. The Mac default viewer preview does this. As long as you make some other application active, when you bring preview to the front, the reload occurs. For me, I use LaTeX to generate the new pdf in one application and when I bring the preview version back up, the changes have been reloaded. Not the answer you're looking for? Browse other questions tagged mac viewers or ask your own question. Free PDF viewer allowing to measure in a document?